Part of the largest all-suite hotel chain in the country, the Embassy Suites Convention Center is located in "the heart of all that's happening in Las Vegas." 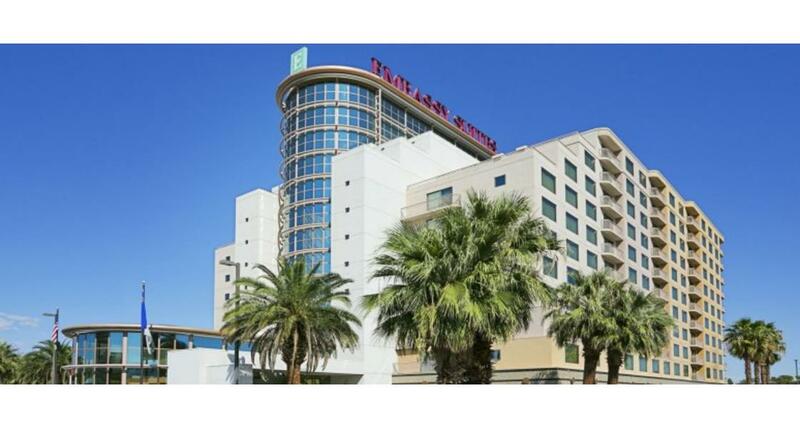 Within walking distance of the Las Vegas Convention Center, the Sands Expo Center, the Las Vegas Monorail Station on Paradise Road (with links to nine major resorts) and the world-famous Strip, this hotel is an ideal spot for business or leisure travel. The hotel has over 250 two-room suites which provide plenty of room for work or relaxation with private bedrooms and an adjoining living room with a sleeper-sofa. Eight conference suites provide convenient meeting space for up to eight people. Each suite includes a galley kitchen with wet bar, refrigerator, coffee maker and microwave. There are two dual-line telephones with voice mail and data ports, plus Wi-Fi Internet access. For added convenience, every room includes an iron, ironing board and hairdryer. Nightly Evening Receptions include complimentary snacks and beverages. Watch the sunrise over a free, cooked-to-order breakfast.